After a superb performance by Max Verstappen to take the lead in the 2018 Brazilian Grand Prix, a collision with back-marker, Esteban Ocon, saw Lewis Hamilton seal a fortuitous win. Verstappen was on fire from the very start and made short work of both Ferraris and Valtteri Bottas in the Mercedes. By lap ten he was in second place and containing Hamilton's advantage to around 1.7 seconds. Lap 19 saw Hamilton pit for a set of medium tyres in the hope of completing the race without further stops. Verstappen, though, pushed on to lap 35 before pitting and his first stint on the super-softs saw him create a lead that was almost enough to rejoin in front. However, after pitting, he found himself 2.5secs behind Hamilton but pushed hard and, within two laps, had the Briton in his sights, passing him on lap 39. Verstappen was cruising to victory when, on lap 44, he and Ocon made contact as the back-marker was attempting to un-lap himself through turn one and into turn two. Ocon, who was on the inside line, caught Verstappen's right rear with his left front, causing the Red Bull to a spin into the run-off area, leaving Verstappen fuming. Seething, he radioed the team, "What an idiot," concluding with expletives that needed to be beeped out. Ocon said, "I came out of the box, the first lap I stayed behind, the second lap the team said you can un-lap yourself if you want. "I was side by side and I couldn't disappear and then I saw he turned and we collided but what I am really surprised about is his behaviour after the race. We went on the scales he started to push me and wanted to punch me and stuff and this is not proper." Ocon was handed a 10-second stop-go penalty by the martial, the most severe punishment before a disqualification. Verstappen found himself 5.7secs behind Hamilton once he rejoined the race but, although he inched himself closer to the leader, it proved a gap too far, finishing 1.5 seconds behind. After the flag, his engineer said: "I don't know what to say, mate." Verstappen's response was clear and direct: "I know what to say. I hope I don't find him in the paddock." At the driver's weighing area after the race, Verstappen confronted Ocon, pushing the Frenchman three times and threatening to punch him. The race stewards summoned the two drivers after the incident, dealing Verstappen "two days of public service" to atone for "making deliberate physical contact with" Ocon. There was a brief discussion between Verstappen and Hamilton before the podium ceremony, with the Briton saying that Ocon had the right to un-lap himself. Verstappen agreed, before adding: "But you can't crash," to which Hamilton responded: "You had more to lose than he did. He had nothing to lose." During Verstappen's post-race interview, he said: "You do everything right and then you get taken out when he is being lapped. "The car was working great but I don't know what to say. I'm happy with second but we should have won. "He has the right to un-lap himself but still you have to be careful. He has always been an idiot." Hamilton's win secured the constructor's championship for Mercedes as Ferrari fell off the pace. Even though Kimi Raikkonen finished third, the Italian cars found themselves wanting as the leaders pushed ahead. Daniel Ricciardo took fourth, ahead of Valtteri Bottas, with Sebastian Vettel only managing to secure sixth spot. Two weeks time sees the season finale in Abu Dhabi, which always delivers an exciting race, with wins for three different drivers from three different teams in the past three races. 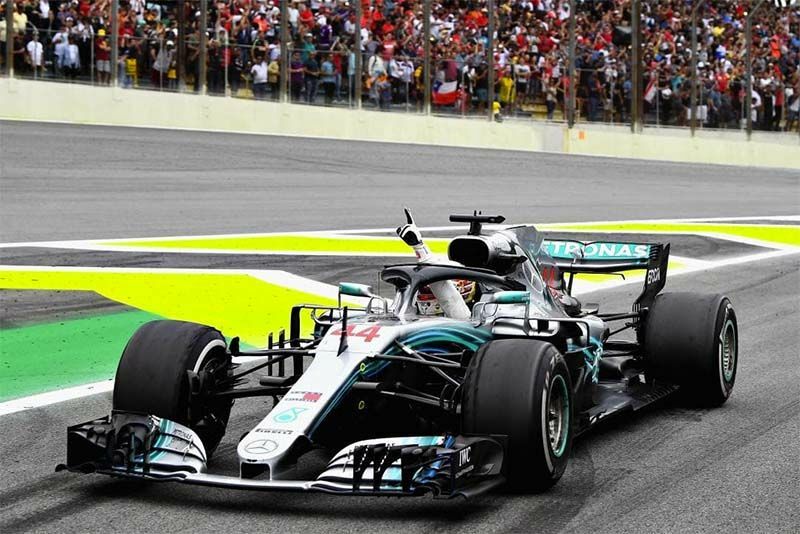 Check out the highlights from the 2018 Brazilian F1 GP here. Video: James Corden Interviews Lewis Hamilton While He Drives A Sl63 Amg In Anger! Video: World's Greatest Drag Race 5! Ever Wonder How Hydrogen Fuel Cells Work?